Moose thinks Van Morrison is most soulful white dude in history. After listening to this song, it's hard to argue that he's not. "Madame George" clocks in at almost ten minutes, but manages to hold you each second with a unique mix of incredible emotion, strings, a flute, and the moving voice of Morrison. The songs progresses in stages. It begins with Morrison, a guitar and a bass. A snare drum makes an appearance with the violin and flute soon joining in. The instruments provide the perfect backdrop for the lyrics, which present a dreamlike picture of the mythical Madame George. Overall, the tone of the song is melancholic and nostalgic, with lyrics describing Dublin and memories of past times. More than other songs, the song really is poetry put to music, but in a stream of consciousness style that manages to be both magical and haunting at the same time. 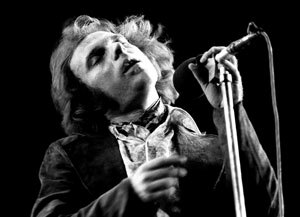 Morrison's soul is on full display in this song as he sings about lost love with a combination of pain and strength. His soul does sometime get the best of him, and at the 6:30 mark he makes some of the strangest sounds ever uttered in music, doing his best Irish Schwarzenegger impression. This song has a way of staying with you, and the melody and strings have weaved their way into my head time and time again. The best songs have a way of doing that.